[% 12025 | | Norwegian’s %] shipbuilders never seem to rest. This week, the line took delivery of the completed Norwegian Gem and began work on the line’s next new ship. With the introduction of the Gem, Norwegian has established itself as the youngest fleet in the industry. 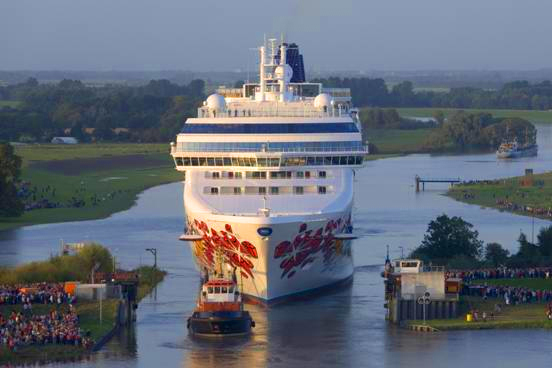 NCL welcomed the Gem to its fleet during a ceremony in Eemshaven, Netherlands. After a stop in Rotterdam, the new ship will spend some time in Dover, U.K., the homeport for its seven-night Mediterranean itineraries. The Gem will make its U.S. debut in Boston on December 12, get christened in New York on December 18, and then spend the spring cruising seven-night Florida and Bahamas itineraries and 10- and 11-night southern Caribbean sailings. The ship will return to Europe in summer 2008 for more seven-night western Mediterranean sailings, this time from Barcelona. If you can’t get enough of Norwegian’s new ships, you won’t have to wait long for another. During a special ceremony, the first piece of steel was cut for the line’s first F3-class ship. The new ship will debut in 2010, but it won’t be a sister to the Gem. Instead, this new class will feature 4,200 passenger berths (NCL’s biggest ships to date), 60 percent more guest space, more onboard activities, and verandahs on all outside cabins for a total of 1,415 balcony cabins. Knowing how many unique amenities Norwegian has squeezed on to its other ships, the F3 ships should be pretty spectacular. If you’d like to book a cabin on the Norwegian Gem, you can check prices and search for available staterooms on the ship’s website.